Successfully Added Remote Activated Mini Camera (Gum Wrapper Sized) to your Shopping Cart. Mini camera with remote activated audio and video recording. Perfectly sized to be hidden within a chewing gum wrapper for undetectable covert surveillance. This extremely miniature sized camera is a dream come true thanks to its convenient remote control operation and incredibly discreet form factor. Place this micro sized gadget on a desk, in your shirt or just about anywhere you want to capture high quality undercover videos. The I38 is built using top grade materials such as high tensile strength plastic casing and high quality internal micro-chip components. Whether you are trying to capture your boss's abusive behavior or catch a burglar in the act, the I38 will get the job done and without suspect. But don’t think this ultra compact camcorder is limited to use only. With its extremely portable design you can take the I38 with you wherever you go and always be ready to capture high quality videos on a moments notice. The I38 is extremely easy to operate too. Simply place this device wherever you like, press the RECORD button on the remote or device, and when you are finished hit the STOP button and the video will automatically save onto the micro SD memory card (2GB TF card included). It doesn’t get much easier than this! This amazing device can also be used as a standard USB memory stick to conveniently transport all your computer files as well. With all this device has to offer it is hard to imagine a better cam at such an incredible wholesale price. Place your bulk orders now while this ultra compact camera is still stock and ready for immediate shipping. The I38 is proudly presented to you by the leaders in wholesale electronics, Chinavasion. How do I charge the I38? How many meters will the remote work from? It will work from about 10 meters depending on your surroundings. Want to know more about the latest in personal electronics and digital media products? Do you want to read stories regarding new products before anyone else? Then read our blog at ww.chinavasion.com or subscribe to our RSS newsfeed to keep up with what is happening in the world of China Wholesale Electronics. Just got this in the mail today. The range of this device is as advertised. I can put the camera in one room and go to another room with standard sheetrock and metal frame walls and the remote will activate/deactivate with no problems. So far I have tested it about 20ft away and in two separate rooms. Video quality is as advertised as this is not a high resolution camera. 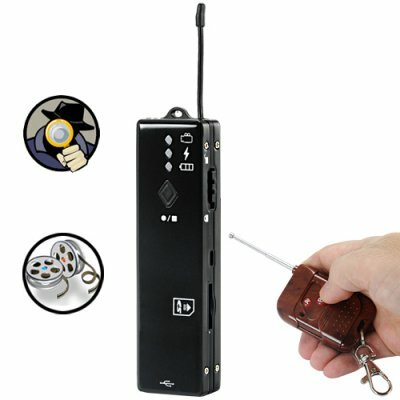 Great little gadget and this will definitely capture which employee I have coming in my shop and taking my tools after hours. It will also record while plugged in to usb power which is a plus. The description says it will record up to 8 hours on a 2 gb card so I am assumming that is the battery time and not the record time as the card will hold approximately 16hours of video at 2mb a minute Great little gadget.